Think your PC needs an upgrade? It's probably still fine. If covering the succulent PC gaming deals over Black Friday and Cyber Monday taught me anything, it’s that my current rig is less than stellar—and a few years out-of-date. Okay, I’ve known it’s been out of date for a while, but just haven’t upgraded yet for one reason or another. I don’t need fancy RGB lighting or to play games in crisp 4K, but I unfortunately wasn’t able to grab an Intel Core i7-8700K or a discounted GTX 1080 Ti, something that could handle games flawlessly on Ultra at 1080p. I didn’t even grab a dang Instant Pot like all the other writers here at PC Gamer. But that’s okay, because while I’ve been lamenting on yet another missed opportunity to finally start gathering components to build a better rig, I’ve taken to Reddit as a self-prescribed therapy, specifically the tech support gore channel and a few other PC-related ones. It’s been an emotional day filled with laughter and astonishment, and my forehead might be permanently wrinkled from confusion, but if you find yourself in a similar emotional predicament, I think you’ll walk away feeling better about your rig and about life in general—unless you are one of these people, in which case I recommend a box of tissues and a good hug. Reddit user TehAbsMan explains how this brand new graphics card met its fate. 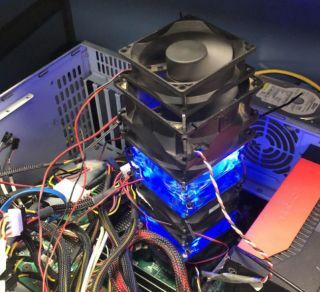 They were asked to build a VR-ready PC for a school as part of an effort to teach the students about new technologies, so of course it included a RTX 2070. Another tech ended up removing the card because it was having issues, and apparently someone slapped, roundhouse kicked, punted, or otherwise forcefully knocked the card off the desk. The twisted metal and bent plastic is terrifying. Did this person throw it against a wall? Did they toss it into a ceiling fan? Did this person hate VR so much that they didn't want anyone else to experience it? Who knows. The perpetrator has not been caught, sadly. I’m just glad this wasn’t my imaginary RTX 2070. Good luck getting that RMAed. I don’t even know what’s going on here. All I see is a tornado death trap for bugs lured by the blue LED glow. Is this what some people did before liquid cooling, stack several small fans to create a cold vortex? Or maybe it’s some kind of ritualistic offering to the PC gods. It could totally be a statue in their honor. Maybe they look a little like Cthulhu, but instead of tentacles they have unruly cable management. I know AMD CPUs ran hot back in the day, but this seems a little excessive and inefficient. File this under WTF. I’m imagining several CSIs picking all the dust out of this PSU for evidence, because a crime has definitely been committed here. (Sorry, not sorry.) That looks like the inside of my vacuum cleaner, which is currently full with some sort of combination of dirt, dust, and cat hair. It definitely looks like a cat has been living in that PSU, or a small fluffy rodent of some kind, and then the CPU ate the rodent and spat it back out like an owl pellet. There’s probably bones in there, too. Someone should check it for bones. Moral of the story, dust your PCs folks. There's a story behind this. There has to be. I mean, if you must remove the heatsink from the CPU to clean it, just build a whole new computer. It's not the most cost effective solution, but my expertise in this area is limited. So, I asked our senior editor Jarred Walton for his advice. He said yanking the whole thing off the motherboard could damage it and/or the CPU. Gently twisting back and forth is the best method. And never use permanent adhesives between the heatsink and CPU heatspreader. Good advice, Jared. If you manage to separate the two, you'll definitely want clean the surfaces and then apply new thermal paste, too. If you don't take Jared's advice and screw up the CPU beyond repair, you have to buy a new CPU anyway, so you might as well use that as an excuse to buy a new PC and never touch the inside of it ever again. Not even to dust. Okay, you can dust, but don't take anything apart. Just don't do it. I've never seen a teeny, tiny living room inside of a PC before. Isn't it adorable? Seriously, it's cute. Now I know where the little cyberpunk elves that make your computer run live. It’s got everything for a perfect little retro living room. The red floral fabric on the sofa and armchair, the matching frayed rug, the lamp illuminating the circuitry behind it—even the gumball machine with the tiny gumballs inside, and the tiny magazines inside the tiny magazine holder. Everything is so tiny and cute. I want to live in it. Be right back, I'm going to go redecorate my living room.